Traffic used to be a frequent headache for people in Hangzhou, the eastern Chinese city that’s home to Alibaba. The city of 7 million people once ranked fifth among China’s most crowded cities, but it has now dropped to 57th on the list. Alibaba says that’s because of one of its inventions, named the City Brain, which uses artificial intelligence to gather information across Hangzhou, such as video from intersection cameras and GPS data on the locations of cars and buses. The platform analyzes the information in real time as it gets more than 1,000 road signals around the city. After two years of testing, the system appears to be working. Alibaba says the City Brain has shortened commutes and also helped first drivers by enabling fire trucks and ambulances to halve the amount of time it takes to get to the scene of emergencies. Some regular drivers confirm things have improved. Ye Bojie, who works for top ride-hailing firm Didi Chuxing, said it once took him 40 minutes to drive 3 kilometers (1.8 miles), but the conditions are “much better now”. “The cities in China probably are facing more challenges than any other city,” said Wang Jian, chairman of Alibaba’s technology committee. But with the technologies like machine learning, communities are getting the tools to solve problems such as water shortages. “Eventually, everything is going to depend on the computing power, just like we depend on electricity,” Wang said. Alibaba’s platform is being used in a handful of other Chinese cities and was introduced last year in Kuala Lumpur, the capital of Malaysia. Last fall, Volkswagen and Siemens began trials of a smart traffic system in the German city of Wolfsburg, which was aimed at helping drivers predict when to expect a wave of green lights. 1. What once troubled Hangzhou according to Paragraph 1? B Its location in China. D The terrible traffic jam. 2. Which of the following about the City Brain is NOT true? A It was developed by Alibaba. B It is based on artificial intelligence. C It can’t analyze road information in real time. 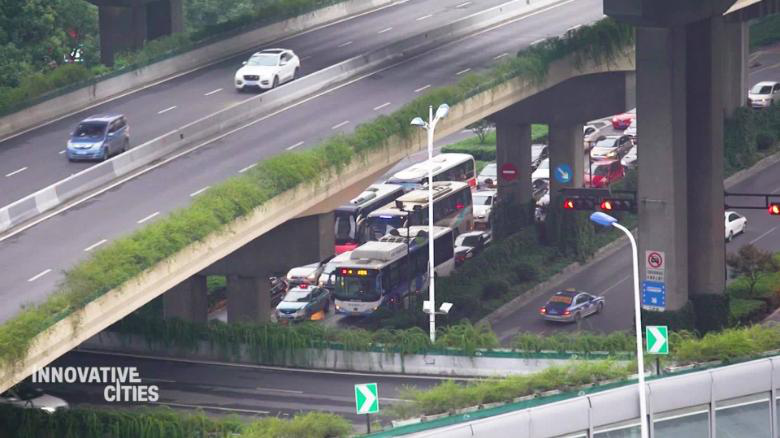 D It’s making a difference to Hangzhou’s traffic. 3. What do the people in Hangzhou think of the system? 4. What was the smart traffic system in Wolfsburg used for? A Reaching scenes of emergencies. B Solving the water shortages. C Providing people with electricity. D Judging the time of green lights.